Injured after committing a bank robbery, John Taylor is desperate to find a place to hide out and approaches the home of Warick Wilson. John manages to get himself invited into the house by posing as a friend of a friend and spinning a sob story of lost luggage and a violent mugging. Inside, Warick, a consummate host, is making the final preparations for an impeccable dinner party. He insists John stay for the party, but as the evening begins it becomes obvious Warick may not be what he first appears. Warwick Wilson is the consummate host. He carefully prepares for a dinner party, the table impeccably set and the duck perfectly timed for 8:30 p.m. John Taylor is a career criminal. He's just robbed a bank and needs to get off the streets. He finds himself on Warwick's doorstep posing as a friend of a friend, new to Los Angeles, who's been mugged and lost his luggage. As the wine flows and the evening progresses, we become deeply intertwined in the lives of these two men and discover just how deceiving appearances can be. 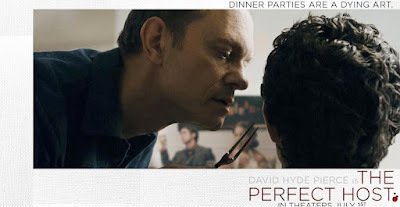 With outstanding performances by David Hyde Pierce and Clayne Crawford, cowriter/director Nick Tomnay takes us on a suspense-filled ride where nothing is as it seems. THE PERFECT HOST is a slippery psychological thriller that exposes true human nature and reveals just how far we're willing to go to satisfy our needs.